Activists wearing animal masks held signs indicating the number of animals killed for meat in the world each year (that is, hundreds of billions), the number killed in a month, in a day, etc. 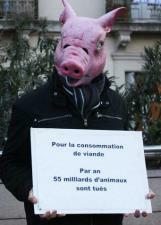 Others held signs on Meat Abolition and panels with photographs showing the horrors of factory farming. Hundreds of leaflets were distributed, and a journalist came to us to discuss the arrangements for a long article on veganism.